Sri Harshavardhana Educational Institutions Inter/Degree College Lecturers Recruitment 2019,Sri Harshavardhana Educational Institutions Inter/Degree College Notification 2019 For Lecturers Jobs,Lecturers Jobs In Sri Harshavardhana Educational Institutions Inter/Degree College. Educational Institutions Inter/Degree College Notification. 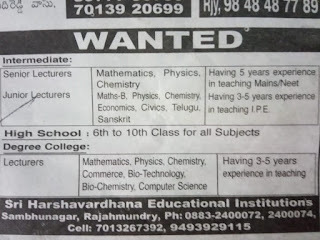 Further details can refer the official website www.harshainstitutions.com for Sri Harshavardhana Educational Institutions Inter/Degree College Lecturers Jobs. Available vacancy, Salary, Important dates, Selection Process, Application Procedure, Qualification are maintained below. Lecturers Jobs In Sri Harshavardhana Educational Institutions Inter/Degree College. Starting Date to apply for Lecturers Jobs : as soon as possible early. For Inter Senior Lecturers: Having 5 Years Experience in Teaching Mains/Neet. 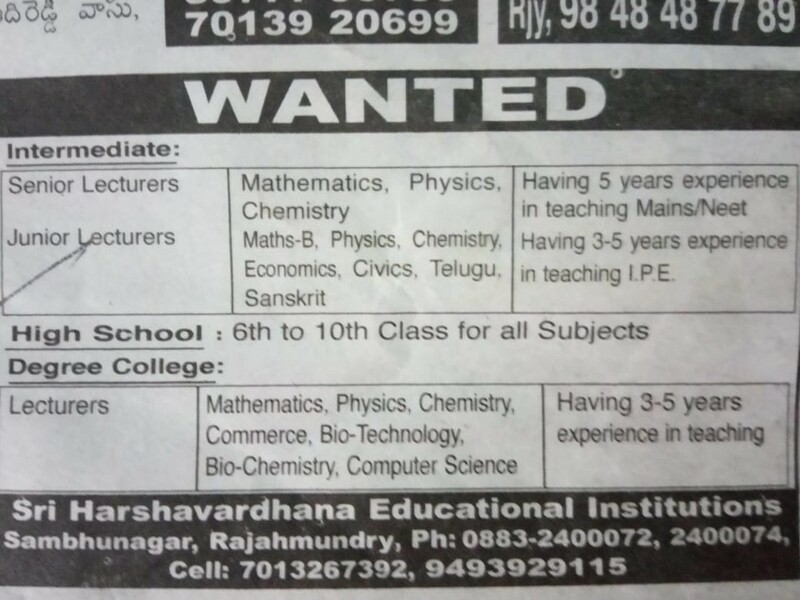 For Inter Junior Lecturers: Having 3-5 Years Experience in Teaching I.P.E. For Degree College Lecturers: Having 3-5 Years Experience in Teaching.